Caleb Podhaczky makes about 20 or 30 espresso coffees a day in his role as a roaster (and taster) for Five Senses, a coffee importer and wholesaler that supplies cafes and restaurants throughout Australia. 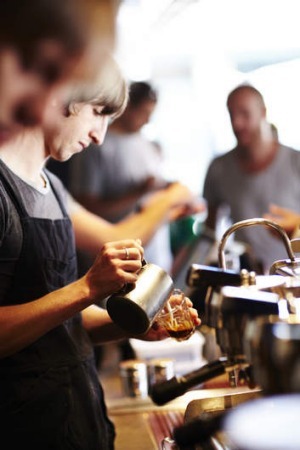 Podhaczky no longer works as a barista but still likes to flex his muscle in competition; he was named Victorian Barista of the Year in 2012 and 2013 and will compete at the Australian barista titles in Melbourne this month. He says making a perfect, cafe-quality espresso at home is achievable with a bit of trial and error. Here are his tips for those with an espresso machine. 1. Beans: Buy your coffee beans from a specialist supplier who knows how old the beans are and when and where they were processed and roasted. 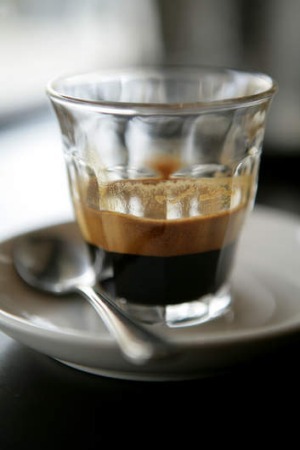 Fresher beans produce a better espresso, which should be viscous and full of flavour with a good crema. A bad coffee will be thin and flat-tasting. Always buy whole beans. Fresh beans should be stored away from light and heat at a constant temperature. There's no need to store beans in the freezer; a cupboard away from a heat source will suffice, but use them within three weeks. Make sure the beans are kept in an airtight container. 2. The roast: Your bag of coffee beans should have a roast date on the back. Podhaczky believes beans should be used between four days and three weeks after roasting for optimal flavour. 3. The grind: It's vital you get the grind right as this controls the rate of extraction, which in turn affects flavour. If the beans are ground too fine, a burnt or "ashy" flavour may result. If ground too coarse, the espresso will taste watery and thin, as the water will pass through too quickly without extracting all the flavours and oils in the coffee. Podhaczky describes the perfect texture for an espresso grind as being "like flour with a little bit of gritty salt or sand through it". The ground coffee should clump a little when you squeeze it (but not be too sticky). For filter coffee, the grind particles should feel more like breadcrumbs. 4. Clean and dry: Make sure there is no moisture (or old coffee grinds) in your porter filter and basket. If the coffee comes into contact with moisture, it could begin extracting too early. Use a tea towel to wipe the parts clean. 5. Tamping: Serious home baristas should invest in a tamper to compact their coffee evenly into the basket. Fill the basket about three-quarters full with ground coffee. Tap the basket on your bench to "collapse" the coffee and ensure the basket is filling evenly. Add more coffee and collapse again until full, but not overly. Tamp the coffee: Podhaczky grabs the tamper like a door knob and leans into it from above with a straight arm – "about 15kg body weight is ideal". If you turn the basket upside down after tamping, the coffee should stay put. After tamping, the basket should be about four-fifths full. If coffee sits too hard-up against the machine's shower screen, you may get an uneven extraction; too far away and the espresso may taste muddy. Podhaczky uses the analogy of a watering can: water poured from too great a height will hit the soil (coffee) too forcefully and churn it up, resulting in mud. 6. Purge your machine by running some water through it before making your espresso. 7. Make the espresso. Different baristas use different rules to ensure consistent and well-balanced espressos. Some, such as Aaron Wood from Auction Rooms and Small Batch in North Melbourne, advocate weighing both the dry coffee and final wet espresso. Wood says a good "brew ratio" is roughly two parts dry coffee weight to three parts wet espresso. So 20gms of dry coffee grounds should yield a final espresso shot weighing 30 to 40gms, depending on your taste. Podhaczky's rule of thumb is to go by volume: "30mls in 30 seconds". Espresso cups generally range in size from 60 to 90mls, but Podhaczky's ideal shot is 30ml. If your machine takes longer than 30 seconds to produce a 30ml shot, your grind is likely too fine and could taste burnt. Your 30ml espresso shot should have a nice crema on top. This is the lighter, fluffier substance that sits on the surface. Crema looks like tiny bubbles and is reddish-brown or hazelnut in colour and dissipates after a minute or two. Lack of crema is a sign your coffee beans are past their best. What's your secret to making espresso at home? Do you use Caleb's method? Share your tips in the comments below. Experience the journey of a coffee bean from plant to espresso cup at The Melbourne Food and Wine Festival's urban coffee farm and brew bar. On now until Sunday March 17, Queensbridge Square, Southbank, Melbourne. Free entry. Coffee and food available for purchase.